ENTER A NEW WORLD OF BEAUTY ! A world where the natural beauty of women is activated by the vital energy of nature. 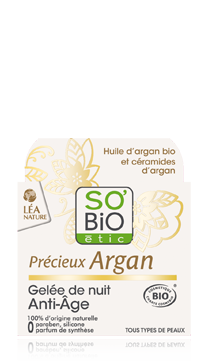 SO’BiO étic® spreads the vital energy of nature by sourcing precious organic active ingredients in their purest and most powerful form. An anti-aging line of skincare that offers an exclusive synergy of active ingredients: organic argan oil and natural hyaluronic acid. Innovative, delicate and fragrant textures for a pure moment of well-being. A whiff of pure oxygen for your skin ! Light and refreshing textures that deliver oxygen to your skin. Pure and aquatic fragrance. Enjoy all of the sensory properties of argan oil in this gel oil! This night gel regenerates your skin an protects it from the effects of the aging process. The light consistency penetrates rapidly into the skin leaving a deliciously light and milky fragrance. 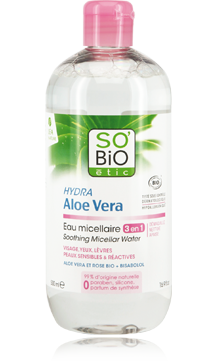 Your skin is hydrated and protected, its original softness is restored. This micellar lotion is especially formulated for reactive and sensitive skin, ensuring the face, eyes and lips are gently but thoroughly cleansed. Dare a new natural beauty. Because Nature is a woman’s best ally in enhancing her beauty, SO’BiO étic® has developed exceptional skincare products that respond to the essential needs of the skin thanks to the vital energy of nature. 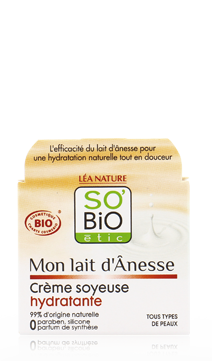 SO'BiO étic® is a brand of the LÉA NATURE group, committed by nature.